Today is my annual slow down day. Every year on my birthday at the encouragement of my wife, I slow down and just move at my own pace for the day. It’s one of the few opportunities when I feel I can rest and not worry about every detail. It’s a great time to reflect and put things in perspective. So this morning I am outside watching everyone else speed up while I rock on the porch with caffeine in hand. I find myself wondering why I let so many things crowd my mind with concerns and worries all other days of the year. Is there really that much for me to worry about that warrants missing out on life? When I was growing up, it was always easy to tell when daddy was worried about something. He would quietly eat dinner, and then excuse himself as he took a long walk down the dirt road on which we lived. We always knew something was wrong when daddy started down the road. We all have our own ways of worrying. For me it is busy work. When I am worried, I seem to fixate on a church project or problem and then pay meticulous detail to it. Often times that detail comes at the expense of my family. Unfortunately I am usually not aware of it until I have missed something that should have been more important to me. On my sixteenth birthday, I listened to a group of doctors break the news to us that I probably wouldn’t live to see my twentieth birthday. Twenty-eight years later I’m still here rocking and realizing that my worries are keeping me from fully living my life. The worries I was full of yesterday don’t measure up to the blessings in my life everyday. We can get so wrapped up in our concerns and problems that we drown out life and God. We isolate ourselves from the spiritual guidance and answers that we need and seek. 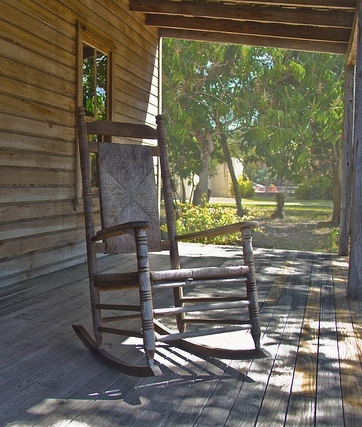 Today in my rocking chair I’m going to count my blessings, starting with you. I’m also going to try real hard to remember just how much worrying is like rocking in a chair. It will give you something to do, but it won‘t get you very far. I have in fact found many such clovers. 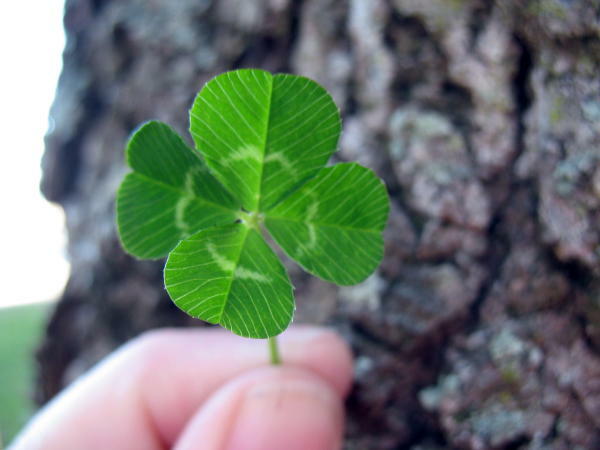 My wife has suggested that if a four leafed clover was within 100 feet of me, I would find it. It may be the only real talent I have, but for some reason they seem to stand out to me almost as if God has painted them florescent green. I used to come home with my hands full of four leafed clovers. I even found one just after proposing to my wife. She keeps it in her jewelry box, beside her rings. Each time I see it, I am reminded of that night and filled with hope as I remember how much I love and am loved. In John 12:32, Jesus foretells being crucified when he says “as I am lifted up from the earth, I will attract everyone to me and gather them around me.” Jesus‘ death on the cross bridged the gap between God and humanity. Churches have traditionally kept crosses in their worship space to visually remind us how much we are loved, and the extent to which God will go for each of us. It is so easy to take for granted God and the blessings that God gives. We need to be reminded of what Jesus endured on the cross so that we will remember that we are loved. And each time we see the empty cross, we can also be filled with hope…the hope that the best is yet to come. I told my son that I had found many four leafed clovers, and even offered to show him the one I gave his mother when I asked her to marry me. He said, “You know they are supposed to be lucky.” I asked, “Do you think I‘m lucky?” Without hesitating he said, “Of course, I‘m your son.” And I am lucky that he is my son…and that I am God‘s. Good luck! Have you ever noticed how waiting for something that may or may not happen seems to make time slow down? The waiting and anticipating tends to drag on us as we watch for something to begin or end before we feel free to move on with life. It would be bad enough if time slowed down for every thing, but its always only for you. The world keeps moving at it’s frantic pace, leaving us behind in our bubble of time distortion if we’re not careful. Family need our attention, work has to be completed and problems require tending. If we let the waiting and anticipating district us things begin to deteriorate making matters worse. We begin to worry, loose sleep and become edgy. Life is filled with smooth and rough roads, clouds, storms and dark days. Sometimes we forget that we are not left alone to fend for ourselves. It is then that life seems to overwhelm us day and night and we often forget the task at hand. God is always with us, and always willing to hear our cries. For us to experience that presence giving peace and courage for tasks at hand we must stay active with God in prayer. As we stay with in prayer, focused on what’s immediately in front of us with God…problems are solved, needs are met, work completed, answers given and people’s lives changed. 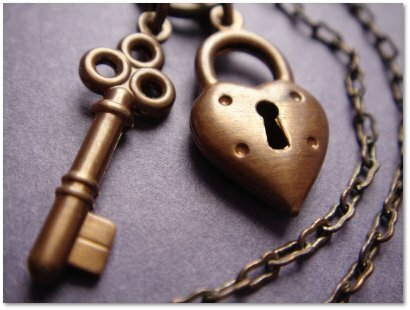 Prayer has been, is still and always will be the lock to our nights and the key to our days. So we pray and keep working.